Yucca plants are very adaptable and thrive in a wide range of environments, making them ideal house or garden plants in many parts of the world. There also many varieties of Yucca, so you can choose which you like best. The Yucca plant, when kept as a houseplant, needs to be watered moderately during its growth period in spring and summer and sparingly during its resting period in fall and winter. As a general guide, an established Yucca plant will probably only need to be watered around once a week during growth, cutting back to once every two or three weeks for the remainder of the year. This will vary depending on numerous factors, such as how big your plant is, how much light it gets, and what temperature your plant is living in. Because of this, you need to pay attention to your specific plant, taking note of its condition to let you know how often it likes to be watered. The best watering method for this plant is to allow the plant’s soil to dry out between each watering. Check the soil by dipping a finger into it, noticing if the top few inches are dry or moist. Only proceed with watering if the soil is dry to the touch; otherwise, wait a few days and test again. If you’re unsure, always err on the side of caution with the Yucca plant. It is fairly drought-resistant, so it will be much safer to neglect its watering needs a little rather than overwater it and cause irreparable damage. The Yucca plant is especially susceptible to root rot, which is the result of too much water. To ensure your watering technique is appropriate for your plant, always follow the dip test guide and check the soil for moisture. When you do water your Yucca, water it liberally until water runs out of the drainage holes. Be sure to remove the drip tray shortly afterward and empty it because the Yucca plant should never be left in standing water. Drainage is particularly important for the Yucca plant as it responds very badly to being waterlogged. Ensure your plant is growing in well-draining soil and that your pot has drainage holes so that excess water can escape (Better Homes and Gardens). This plant is not sensitive when it comes to soil type, so any well-draining soil mix will be fine. You don’t need to overspend unnecessarily on soil for the Yucca plant as it will be perfectly happy in low-quality soil, as long as it’s other needs are being met. Yucca plants that are growing directly in the ground outside will have much lower watering requirements than Yuccas kept as houseplants. They are fairly drought-tolerant, so you should be able to get away without watering at all throughout fall and winter and with just an occasional watering during spring and summer. Depending on how frequently rain falls in your region, you may never need to water your outdoor Yucca plant at all. The Yucca plant is native to very hot regions of South America and the Caribbean, so it does well in high temperatures. It also tolerates low temperatures very well as it is adapted to desert conditions, which can drop to lows of 30° F overnight. The Yuccas ability to handle such a wide range of temperatures, from 30° F to 90° F, making it the ideal houseplant or garden plant for almost any part of the world. It’s very unusual for tropical plants to handle temperature changes with such ease, so you can make the most of this by placing your Yucca in an area that most plants would not be able to tolerate, such as an entryway where drafts are commonplace. The only caveat to this is that once a Yucca has acclimated itself to indoor conditions, it won’t tolerate being taken outside in cold temperatures. It is not uncommon for people to move their Yucca houseplants outside during warmer months to allow them more natural light to thrive and grow. If you do this, you must remember to bring the Yucca back inside before the first frost arrives, as this could be very damaging to a Yucca that is accustomed to living indoors. For Yuccas that are kept as houseplants, ideal temperatures are those that you ordinarily find in a home. If you are comfortable with the temperature in your home, then your Yucca will be too. Ideally, don’t allow temperatures to drop too far below 50° F.
The Yucca plant adores sunshine and will thrive in bright, direct light. It is quite unusual for a houseplant to tolerate direct light so well, making it the ideal plant to put in a sunny window where most plants would scorch. The Yucca will also fare well in bright but indirect light and artificial light. Being a particularly easygoing plant, the Yucca can tolerate low light conditions, but its growth will slow down significantly, and its flower production may cease altogether. Outside, a Yucca plant can be situated in an area that receives full sun or partial sun, allowing it to receive at least a few hours direct sun each day. This will result in a happy and healthy lush looking plant. Moderate humidity is ideal for this plant, so average humidity found in homes will be perfectly suitable. Even if you have exceptionally dry air in your home, the Yucca should fare just fine. Misting with water isn’t necessary to increase humidity, as this plant easily adapts to most conditions. 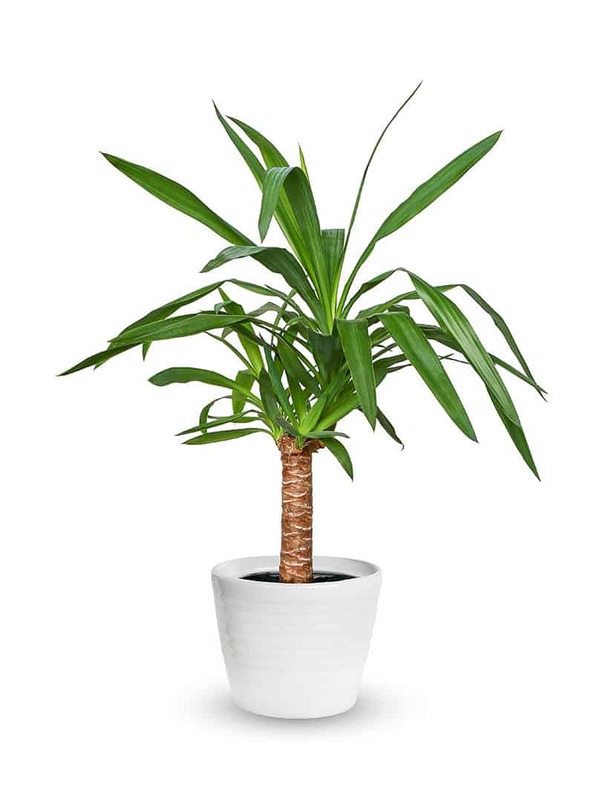 Your Yucca houseplant will benefit from a monthly fertilizer feeding during spring and summer, though this should be stopped completely for the remainder of the year. Use a liquid fertilizer at half of the recommended strength. Outdoor Yucca plants can be fed once a year during growing season. Typically, any fertilizer formulated for outside use will be just fine, though a slow release fertilizer would be preferential. As a slow-growing plant, the Yucca usually only needs to be repotted every two years. It responds well to a tight-fitting pot but shouldn’t be left root-bound for too long; otherwise. its growth will be stunted. Repotting your Yucca is most beneficial for the plant's physical support. As it grows, the plant will become top-heavy, so a larger pot is needed to give the plant some stability and prevent it from falling over. Select a pot one size bigger than the Yucca’s current pot, and, ideally, move it into the new pot in the spring. Mature Yuccas can be difficult to repot due to their size. As long as the pot is already a suitable size to support the plant, you can forego repotting it and simply refresh the soil by scooping out the top layer and adding new soil in its place. When handling the plant for repotting, always wear protective gloves and ensure your arms are clothed to prevent cuts from the Yucca’s sharp leaves. The tips of many Yucca varieties are needle sharp and have actually caused numerous injuries to inner ears when people inadvertently were poked in the ear by the plant. In an Australian study, injuries ranged from mild to severe, with some cases of permanent hearing loss (ABC Radio Melbourne). The Yucca plant grows very slowly and should rarely, if ever, need pruning. Although they grow at a minimal speed, they do grow to be very big, both in height and in spread, so you need to be prepared for this when growing a Yucca indoors. If you want to prevent your plant from becoming too big, then you can reduce the frequency that you repot it, leaving three or four years between each repotting. If your Yucca has already become taller than you would like it to be, the only option is to chop off some of the height. To do this, you will need to saw through a main stem, reducing it to a size you are happy with. You will be left with a slightly unattractive-looking stump, but new shoots should sprout from this over time. If you do decide to hack off the top section of your Yucca, then do so with caution. In some instances, cutting back a Yucca is a trauma that the plant cannot recover from. The new stump may not undergo new growth, and the remainder of the plant may die off. If you proceed with cutting back your Yucca, do so in the knowledge that there is a chance that you may lose your plant (Royal Horticultural Society). Propagating a Yucca can be done in various different ways, though the most successful way to propagate the plant is from offsets or stem cuttings. To propagate using offsets, you need to locate an offset on a mature Yucca plant and slice it off. Offsets are produced on older Yuccas, and grow off the stem underground. The best time to slice off an offset is in the spring when you are repotting the plant. 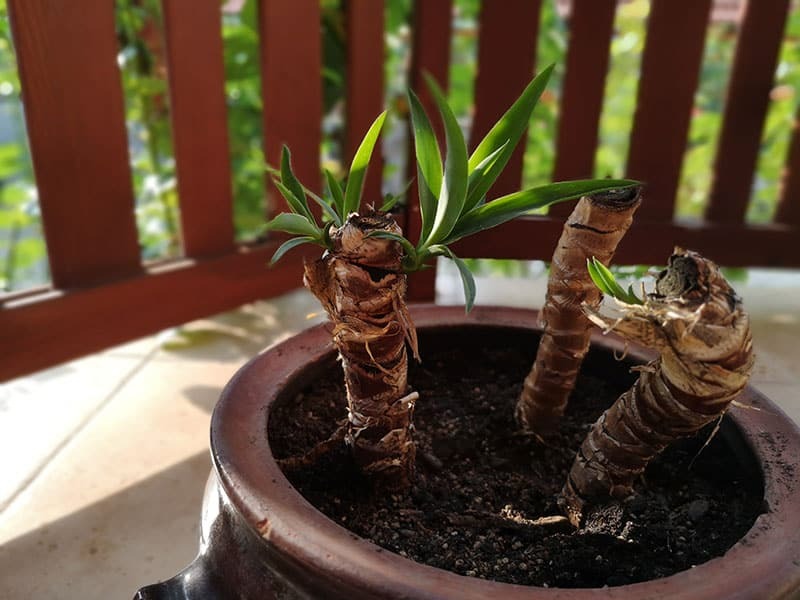 Some offsets may already have formed their own roots while still attached to the mother plant; these can be cut away from the mother plant and placed directly into a pot of soil where they will develop into a new Yucca. Offsets that do not have their own roots already will need to be treated differently and will take a little longer to grow into a new plant. Put the cut offsets into a cool and dark area for a few days to dry out, and then, move them to a pot of ground pumice. Place the pot in a cool but bright area and wait for roots to develop. After around two weeks, roots will form, and at this point, you can begin to water the offsets every week or two. Roots will be established within one to three months, at which point, they can be potted into individual pots. Water sparingly only when the top layer of soil is dry and do not feed until the plant has fully developed. Keep the new plants in bright but indirect light, moving into full sun locations when they are more established. Using stem cuttings is the other most common propagation method for Yuccas, and it is ideal if you want to cut back your Yuccas height anyway. Using a stem cutting of at least four inches in length, dip the raw end into rooting hormone and then, pot it into soil. Ensure the stem is sufficiently supported by the soil so that it doesn’t topple over. Keep the soil moist but not wet and wait for new growth to happen. When new shoots appear out of the top of the stem, it means roots will also be sprouting from the bottom of the stem. Once the cutting has developed into a plant in its own right, you can continue with usual Yucca care. There are 40 species of Yucca, with half of these being native to the United States. They vary in size from miniature plants to giant towering ones, and some have unusual features such as edible flowers or medicinal roots. Some of the most popular varieties of the Yucca plant are listed below. As suggested by its name, this Yucca has very sharp leaves that can easily cut skin if you brush past it with bare arms or legs. For this reason, plant it in secluded corners of gardens where pets and children are unlikely to roam. The special feature of this plant is the vertical flower stalk, which reaches up to eight feet upwards. The stalk is adorned with large white flowers shaped like bells, which give off a sweet smelling fragrance and attract hummingbirds. This enormous Yucca is native to the southeastern US and grows to heights of eight feet tall. As you would guess from its name, it is an especially cruel variety, easily injuring passersby with its razor-sharp, sword-shaped foliage. For this reason, handle it with care while wearing protective clothing, and when planting outside, make sure it’s away from walkways or areas with heavy footfall. In the summer, this plant produces an abundance of flower clusters up to two feet in length. This is the most common variety of Yucca used as a houseplant. Outside, it can reach heights of 30 feet, though it is a very slow grower and will happily live inside for many years before it outgrows the space. This variety of Yucca doesn’t tolerate the cold well, which makes it ideally suited to life indoors. 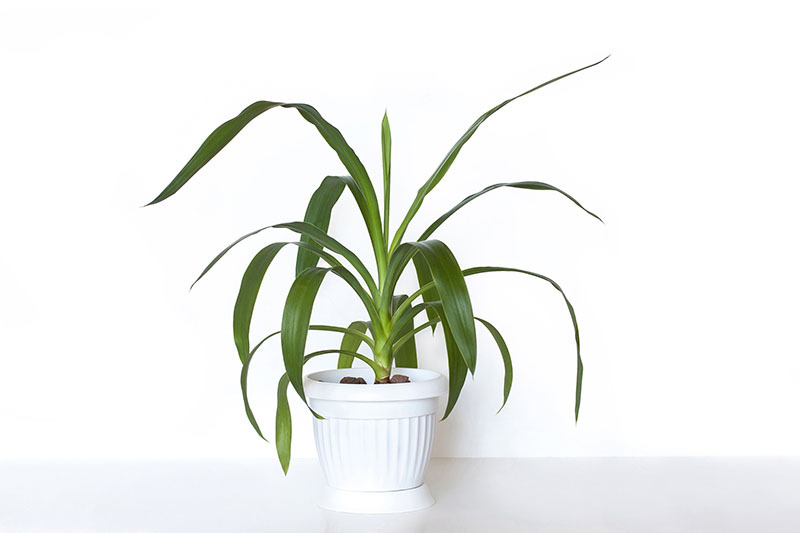 Another reason it a popular choice of houseplant is the fact that it’s leaf tips are not needle-sharp like most Yucca plants, hence its common name of Spineless Yucca. As the name implies, this plant grows edible fruits of a similar shape to a banana. They should be cooked before consuming and taste quite pleasant. At around five feet in height, this is one of the smaller Yuccas. In the summer, it features flowers that can range in color from white to purple. The foliage has a slight blue hue, which gives the plant added appeal. This Yucca is native to Texas and is versatile as a garden plant as it thrives in both shade and full sun. Its pale green leaves have a blue tint to them, and the flowers are white. This plant is ideally suited to use as ground cover, as it only reaches around one foot in height, but it has good leaf spread. This variety of Yucca has medicinal qualities. It is a rich source of saponins, which are claimed to relieve symptoms of arthritis and joint pain. Extracts of this Yucca are often found in pet food and other animal food to help support good joint health. This cold-hardy variety of Yucca grows to heights of 10 feet. Its leaves are particularly striking in shades of blue and gray. Thanks to its tolerance of low temperatures, it is grown outside as far north as New York. This Yucca has green leaves with red edging which are several inches wide. Curly fibers sprout alongside the leaves in shades of white, giving an interesting juxtaposition of both dainty and sturdy foliage. As the plant grows taller, to several feet in height, the leaves twist around to give it its common name. Native to Texas, this variety thrives in a range of lighting conditions, from full sun to partial shade. Which Yucca variety do like best? Let us know in the comments and share this with other Yucca lovers!